Just when you thought the Apple TV was just another set-top box, everything has changed. The Cupertino company just announced the biggest Apple TV upgrade in recent memory, one that transforms the little box into a whole new platform for your home. The Apple TV hardware looks largely the same but bigger. It’s a little bit taller and packs a bigger punch. But it’s still pretty small and very black. However, the remote’s been completely redesigned in a very exciting way. More on that in a second. “We believe the future of television is apps,” said Apple CEO Tim Cook, to no one’s surprise. That means that Apple is opening up a whole new platform for developers to create TV-specific apps, namely games and entertainment programming. To do this, Apple is creating a new OS, appropriately named tvOS. The new tvOS-powered Apple TV will also be Siri-powered so you can do all sorts of handy voice controls for easy navigating. The new app capabilities also offer easy-switching so you can check the weather or your favorite baseball team’s score. Apple Music will also be supported on the new Apple TV. As we expected Apple’s completely redesigned the remote for the Apple TV. The Two big differences are a glass touchpad on the top and a new button to beckon Siri. The little black rectangle is also equipped with an accelerometer and gyroscope so you can use it a little bit like a Nintendo Wii remote. It’s also Bluetooth-powered so you don’t need to point it at the TV. In fact, you can even turn your TV on and off and control the volume with the Apple TV remote. It lasts 3 months on a single charge and uses a lightning post to charge. There’s also a toggle for volume, a menu button, a home screen, and a play/pause button. And it kind of looks like a tiny little iPhone, except without a colorful touchscreen. The touchpad essentially works the same way as other iOS device, though, except your swipes are being registered on your TV and not the gadget in your hand. So if you’re browsing through movies, you can swipe your thumb and zoom through your entertainment options. You can also move through shows or movies using the touchpad. Here’s the kicker, though. Some apps will let you use an iPhone or an iPod touch as a game controller. So that makes multiplayer pretty damn easy. You can even start playing a game on your iPhone and move to your Apple TV when you get home. Apple is even allowing third parties to developer their own external controllers. So that makes non-stop fun even easier! 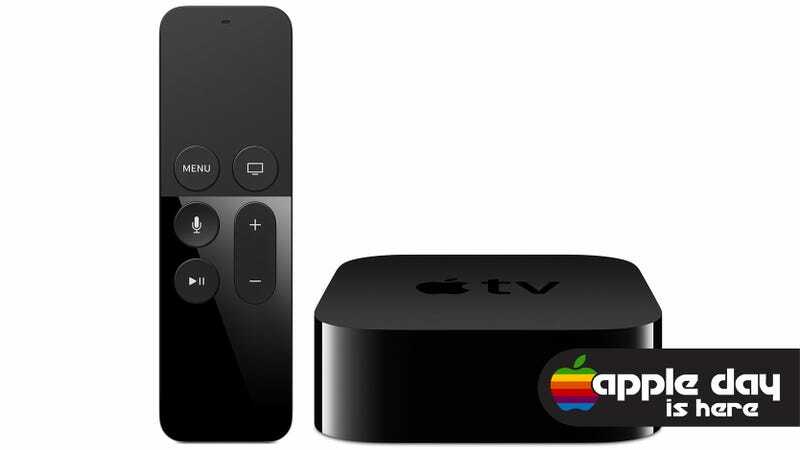 The new Apple TV comes with a 64-bit A8 chip and Bluetooth 4.0. It has an 802.11ac Wifi antenna as well to ensure smooth streaming. The new Apple TV will come in 32-gigabytes or 64-gigabytes of storage. The 32-gigabyte model will cost $150, and the 64-gigabyte model is $200.